This week we got the exclusive chance to interview Dr. Catherine Drescher, Cluster Manager of the ImmunoSensation Cluster. Catherine studied Molecular Biomedicine in Bonn and did her PhD at the Institute of Experimental Immunology. There, she worked on immune tolerance in the kidney and cross-priming of cytotoxic T cells. 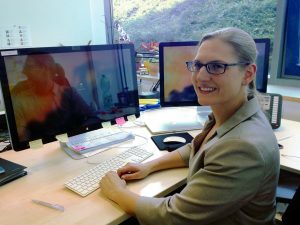 After one year as a postdoc, Catherine switched into Science Management and became Manager in the ImmuoSensation Cluster last year. Here, Catherine tells us about her way into Science Management and what she likes about her job. First, what does a Science Manager actually do? Well, first of all, the term “science manager” is not that well defined. The field emerged roughly 15 years ago and even if there are several certificates, MBAs and other courses available by now, there is still no formal qualification existing. If you look up “Scientific Management”, you will find all kinds of positions, including the posts of Dean or Rector. If you apply for a position in science management, you can end up managing a specific project, a master’s course, a graduate school, a division within the university (e.g. international office, office for research), or even a Cluster of Excellence. That means that the tasks of different science managers differ significantly. What they all have in common is a bridging function between administration and scientists. To generalize a bit, you are usually involved in strategic development, implementation of new ideas and change management, finances and, last but not least, funding applications and coordination of different projects. Why did you go into Science Management? The different topics in life sciences always fascinated me. That’s why I studied Molecular Biomedicine in the first place. Already during my studies, and even more so during my PhD, I learned that I love strategic thinking, “handling people” and discussing the overall picture more than I loved pipetting. In addition to that, building up new things excites me. I easily get bored when I have to do the same tasks day by day. I wanted to be close to science, but not doing it myself. Therefore, I decided to take some general management courses (including basics in organization, administration and controlling; business administration; business finance and accounting; communication and personnel management). After finishing, I applied for different positions in consulting, specifically in business development, as well as different branches of scientific management. When I was offered a position as scientific coordinator for the focus area Immunology and Infectious Diseases at the Medical Faculty Bonn, I did not have to think twice and declined another offer immediately. I was really thrilled by the opportunity to build up new structures and the chance to use my immunological knowledge (which would not have been possible in many other positions). I also like the idea of the “bridging function” – like DCs have in the immune system 😉 – very much. That is actually why I decided to go into scientific management rather than any other kind of management or business development. How does a day as Cluster Manager look like and what are the tasks you are managing there? First off: I have to add that I am still in the dual role of being the Cluster Manager and scientific coordinator of the focus area Immunosciences and Infection of the Medical Faculty Bonn – the position I started in January 2015. That being said, a day in the Cluster Office never gets boring. So, sure it is a lot of office work: making phone calls, organizing meetings… but being involved in many projects: I started with the development and implementation of a new Master’s course “Immunosciences and Infection” which is currently in the accreditation process and will start in the winter term 2017/18. I am also involved in strategic discussions for the Cluster’s reapplication for the next round of funding. This includes helping with grant applications like the one for our international research training group Bo&MeRanG. Helping in this specific case means developing the curriculum of the training concept, writing parts of the application and keeping track of the over-all progress. To make life even more interesting, I coordinate the different workshops and offers within our graduate program – the IITB. The interactions with our PhD students really bring some variety to the more administrative functions in other fields. Furthermore, there are Cluster events that have to be planned and realized, like the Cluster Science Days, the IITB students’ network meeting or smaller meet-the-expert sessions. Another task is the preparation of our Steering Committee meetings – and being informed about everything every time! Fortunately, I have the best team you could imagine! Without them, I would never be able to complete all those tasks on time. If you want to know whom I am talking about, you can find their colourful pictures here. What fascinates you about your work in Science Management and what are the challenges you are facing in your job? The best thing about scientific management is that you are there, when decisions are made. And even better, you can influence decisions and discuss about the future of science. And (I think I am repeating myself here), it is a job where every day and every task is different and it never gets boring. Yet, some people might still think that no one needs science managers. You even might hear the question if it isn’t only a job option for people who failed in science and don’t know what to do next. Some PIs might think scientific managers are only there to annoy them with requests that would not have been there without science managers. However, this thinking usually stops as soon as a PI really worked together with a scientific manager. We free up time for science, we can make some parts of grant application processes more efficient, and we do what we can to support scientists and research. What are the perspectives in Science Management? The drawback of scientific management currently is that there is no defined career path you could follow. The highest positions in academic science management are Rector or chancellor of a university. But, professors or economists usually hold those positions, respectively. There are some research managers in industry, but they usually start after their Master’s or PhD as project managers. And there are enormous differences between academic science management and research management. However, since there is no direct path into scientific management, it is not surprising that there are no defined future steps. The learning curve is steep and you will be equipped with a large set of skills after a short time in scientific management (if you are good at it). Therefore, I am really convinced that limits are only in your head.